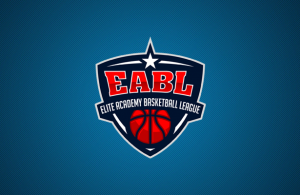 With the Semi-Finals under wraps, the stage is set for the EABL Finals at Essex Sport Arena on April 3. Lets take a look back at Wednesdays Semi-Finals match-ups to see which teams have made it through to the big game! 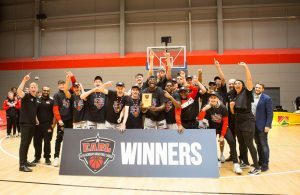 Barking Abbey made it one step closer to a three-peat in the EABL after a hard fought 63-58 victory over Myerscough College on Wednesday afternoon. It was understandably a competitive back-and-forth affair between these two sides, as the two teams faced off against each other in last seasons EABL Final. Myerscough came out the stronger of the two in this one, jumping out to a 7-0 start which would be the largest lead of any team in the game. Abbey then chipped away at the gap in the first quarter behind some strong play from Robin Bedford (10 points) and Jonathan Brown (18 points) ending the quarter down 17-19. The second and third quarters stayed close with the lead changing hands multiple times, and both sides imposed their impressive defensive presence as points were hard to come by. Myerscough entered the final period with a 51-50 lead, but they were held to just 7 points in the quarter through some lock-down defense from Abbey. After a steal and finish from Spyros Kapsalos (14 points) to give Abbey a 58-55 lead, Amari Williams (13 points) went 1 of 2 from the line, before Mate Okros (11 points) was unable to convert on a three-point play that would have given Myerscough the lead. In the final 90 seconds, it was coach Lloyd Gardner’s side who made the crucial plays, as Chris Feeney finally found his range for three whilst teammate Spyros Kapsalos scored from an inbound play with 22 seconds left to seal the game. 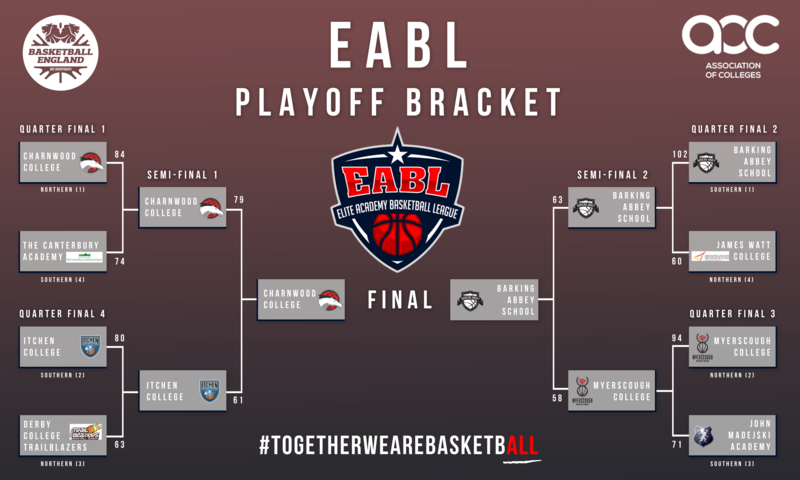 Reigning EABL Champs, Barking Abbey will now return to the Finals and will look to retain their title for the third straight year over the Charnwood College Riders on April 3rd at the Essex Sports Arena. In an exciting Semi-Final match-up between two elite sides, Charnwood defeated Itchen on their home court 79-61 on Wednesday in Game 2 of the EABL Semi-finals. Itchen started the game off aggressively with Jeremy Sochan leading the charge with some tough finishes and excellent defensive possessions, dropping 7 of his 10 points for the game in the first quarter. Charnwood would struggle to find their offensive rhythm in the first, however, Blaize Sagna (16 points) and Hosana Kitenge (23 points) kept the home team within touching distance combining for 13 of their teams 15 points in the quarter. Itchen led by 6 going into the second. Charnwood responded in the second half and stepped up defensively, only allowing Itchen to score 8 points throughout the period. On the offensive end, Hosana Kitenge dominated inside, with 10 points in the quarter giving the big man a total of 18 at the half. Back-to-back threes at the end of the half from Niall Harris (22 points) then saw Charnwood win the quarter and take the lead 35-29. Charnwood didn’t look back and kept on looking to push on the lead, however, Itchen kept fighting, with the big man Turay leading the way with his team high 22 points. Some great offensive rebounds from Itchen kept them within touching distance throughout periods, but the ball movement and offensive efficiency from the Riders proved too much for Itchen to handle, as they took the game with an 18 point victory. 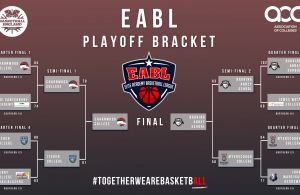 Charnwood will now face Barking Abbey in the Finals in a repeat of the 2017 EABL Finals, and will no doubt look for revenge on April 3 at the Essex Sport Arena in Colchester. Next Story → EABL Coach of the Year Awards announced!